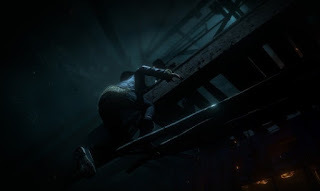 Until Dawn, the new unique horror game for PS4, was also presented at E3 2015. The title brings a cinematic adventure with different choices and consequences, in which a group of young people need to survive the onslaught of a serial killer. We tested the game, which will be available in stores on August 25, and you can see our first impressions below. The demonstration began with a recap of the events of the last episode, simulating some previous decisions to continue the story. The protagonists are now Emily and Matt. We could control two characters in different scenes, and every action contributed to the "Butterfly Effect" (Butterfly Effect): the game system that changes the course of history as the player's choices. Early on, Emily and Matt were surrounded by deer and had to decide between going stealthily among the animals, that appeared terrifying with yellow eyes, or hit it with an ax. The choices appear on the screen and you have little time to decide between one or the other. However, regardless of the decisions, they will always affect the "Butterfly Effect" and the consequences that lie ahead. At first impression, we watch an interactive movie, with gameplay similar to Heavy Rain and Beyond Two Souls. However, the number of scenes in the statement was larger than the number of choices and, for the most part, we are left with control stationary while just watched the story unfolds. That's not very exciting, especially because it is a horror game, in which the same is interesting to interact with the game's events. As a result, Emily and Matt found a radio and needed to achieve the energy to call for help. The combination of dubbing and ambiance created a real climate of terror and panic as Emily screamed for help. However, the succession of repetitive choices and Quick Time Events in a demo with less than 20 minutes broke a little the atmosphere of persecution. The following scenes have continued some choices that, in our case, resulted in the deaths of both characters. At the end, Emily was crushed when the tower collapsed and Matt brutally murdered by serial killer mystery. The game takes very well the potential of the PS4 and showed beautiful surroundings during a demonstration at E3 2015. The feature of the characters is very natural, and the movement during the film CGIs - but only for the images. The effects are neat and the brutal scenes leave nothing to be desired, especially for fans of horror movies. Much of the choices are made during cinematic passages, which reminded us of The Order 1886. Overall, the combination of terror and interactive movie works, and Until Dawn delivers what it promises. The "Butterfly Effect" is interesting and the game show that offers different choices and end, but perhaps the style does not please all fans of the genre.